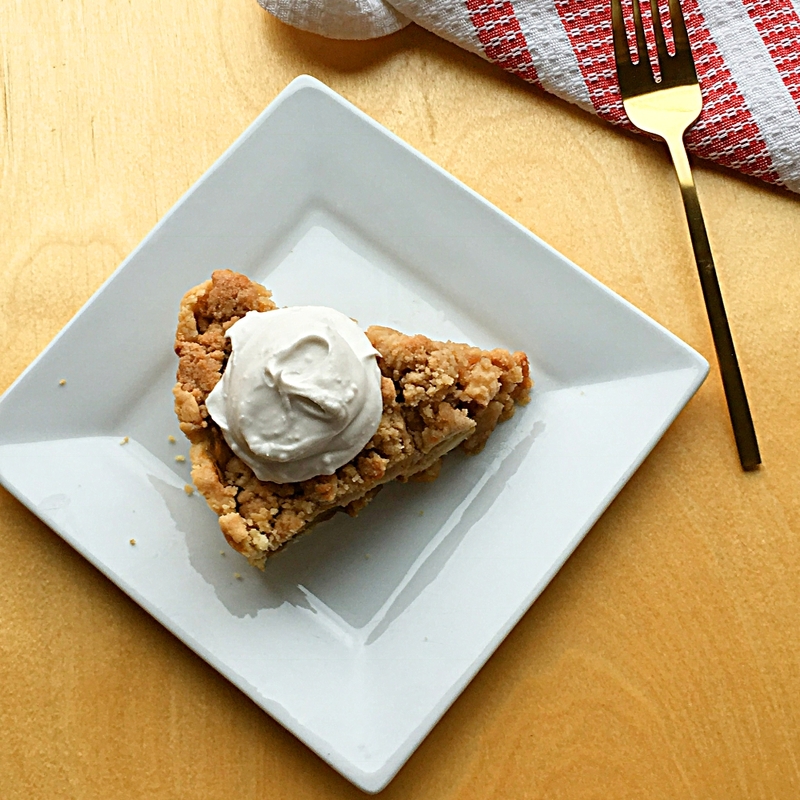 This dynamite grain free pie crust delivers all you expect from a flaky pie crust but without grain based flours. It’s flakey, has great flavor and holds together while rolling out and doesn’t crumble to pieces when cut to serve. It works well for a single or double crust. All you need is blanched almond flour, arrowroot powder, grass fed unsalted butter, an egg and salt. 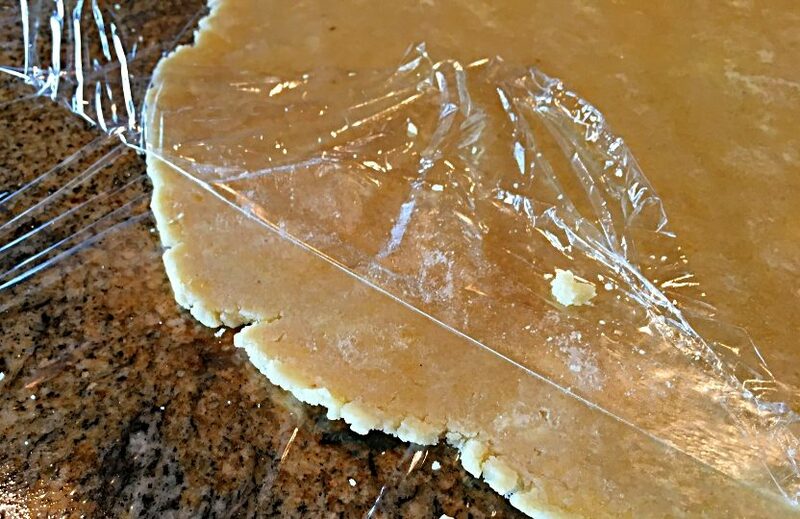 Thanksgiving is a week away so just in case you want to get ready by making crusts ahead and freezing them, I thought I’d share a step by step tutorial on how to make and roll out a pie crust. 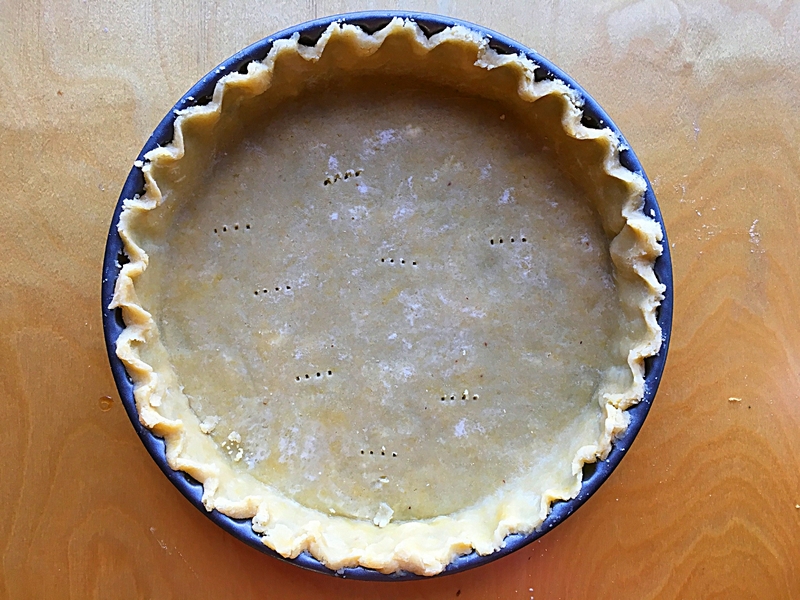 To freeze an unbaked crust, just wrap well after lining pie pan and fluting the edge. Pop in your freezer until ready to use. Keep in mind the photos demonstrate quantities for a single crust. 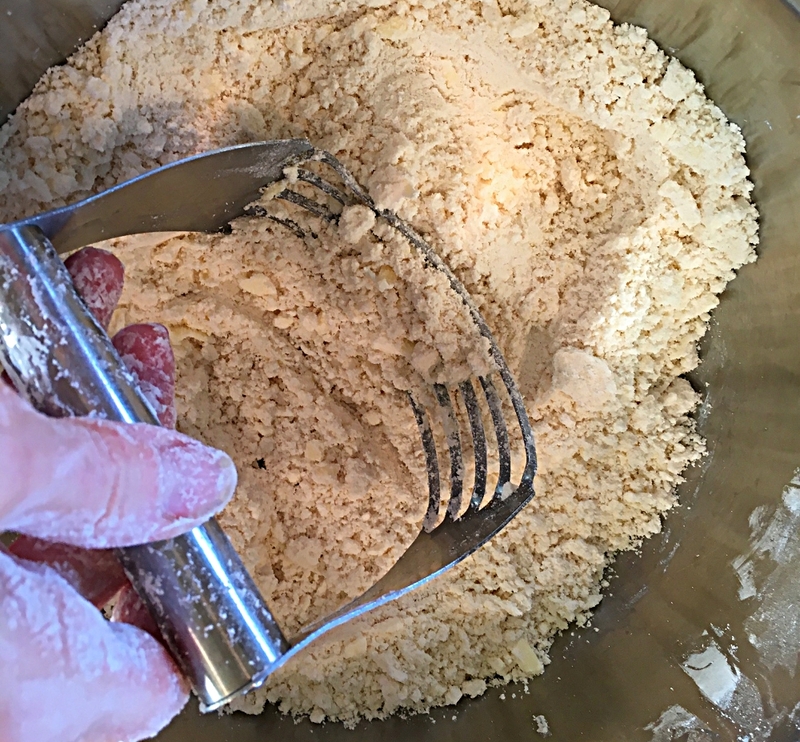 After mixing almond flour, arrowroot powder and sea salt together, grate frozen butter into dry mix. 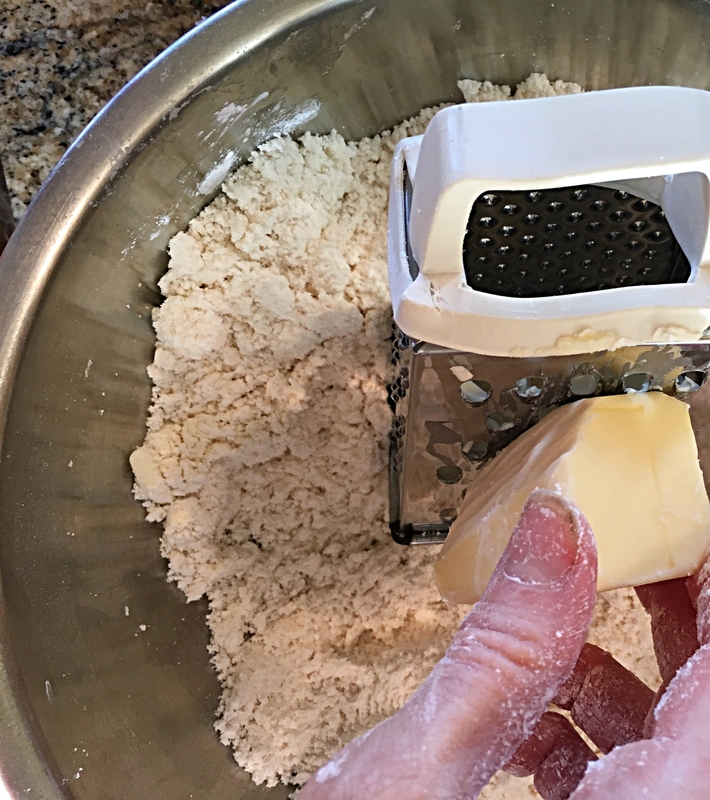 Mix butter in with pastry cutter until it looks like small pea sized crumbs form. If you don’t have a pastry tool, use two knives. 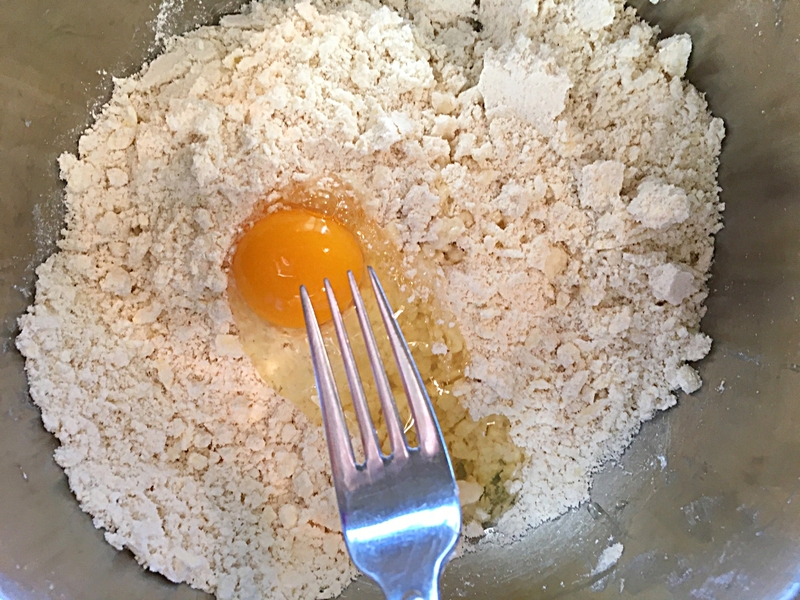 Crack an egg in the center and mix into flours, adding a tablespoon of cold water if necessary. Bring the dough together to form a ball. Wrap and chill or freeze. Roll out according to recipe instructions below. and flip it into the pan. Peel wrap off the top. Trim around the edges, prick around the bottom with a fork, and flute edges. And now you’re ready to fill it! If you’re making a double crust fill it and repeat rolling process to top the pie. 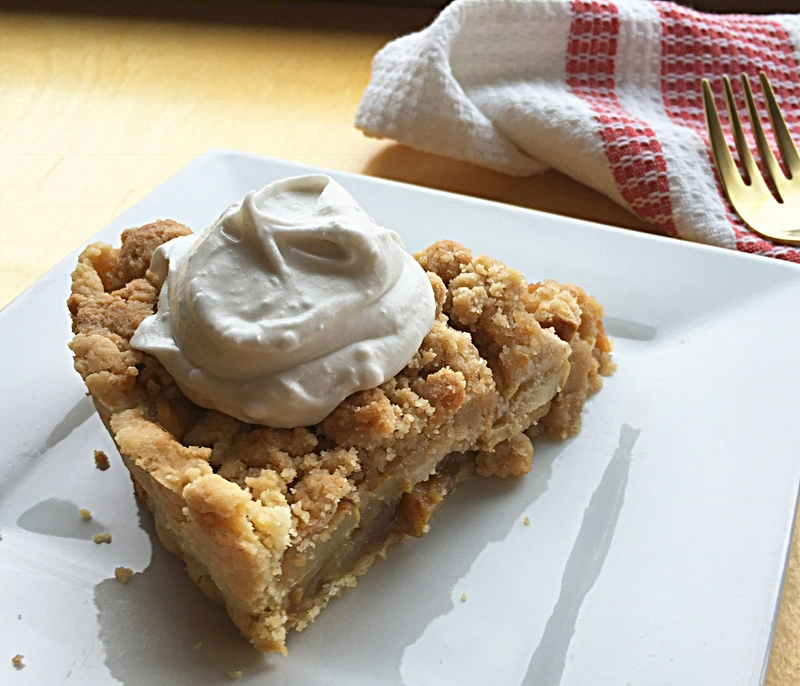 With the family over for dinner last night, I made this crust for this sugar free Pear Crumble Pie for dessert. This crust serves up beautifully and it’s delicious and flaky. We are a pie eating family so I was delighted to find an excellent grain free rolled out pie crust that everyone loved. 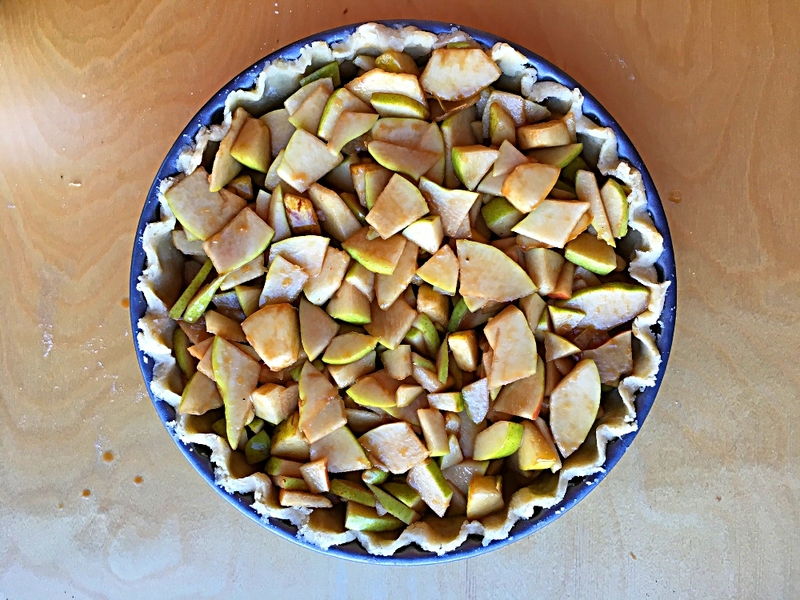 Thanks to Ali from Nourishing Meals for this amazing crust recipe. Here’s the recipe for the crust. I included a single and double crust recipe. Directions: In a medium bowl whisk together the almond flour, arrowroot and sea salt. 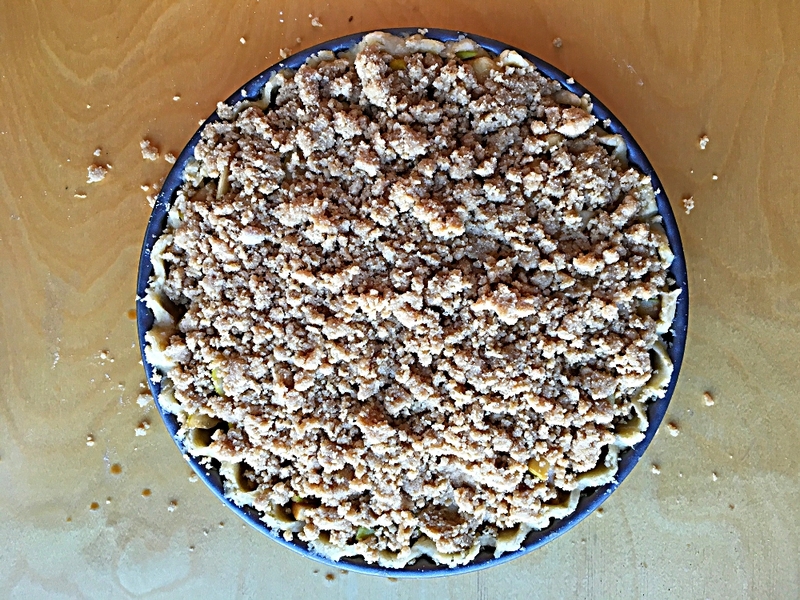 Cut in butter using a pastry cutter until pea sized crumbs form. 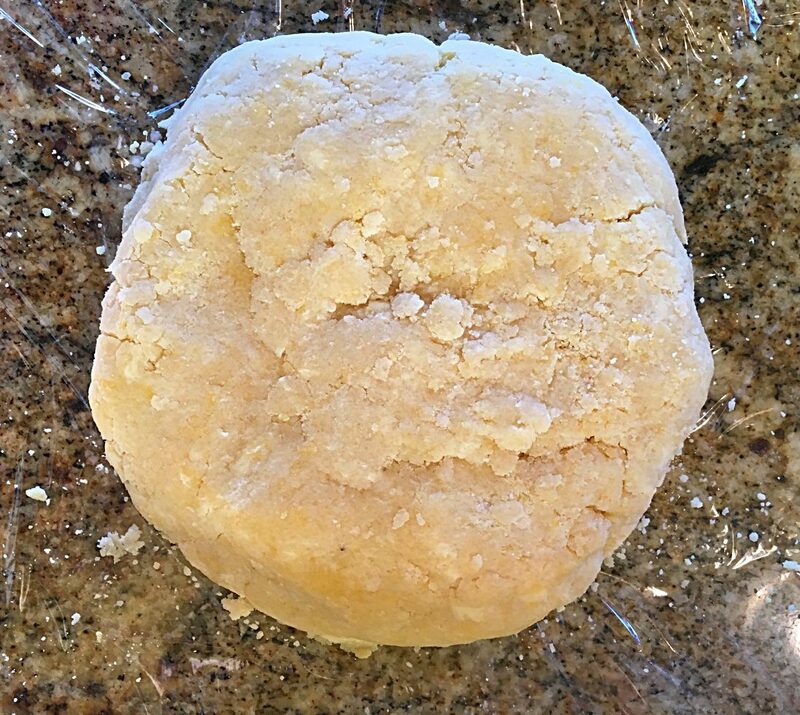 Alternately, I froze the butter and grated it into the dry ingredients and followed up with mixing the butter in with a pastry cutter. Crack the egg(s) into the middle of the mixture, and stirring with a fork combine well. Continue to knead a few times until the mixture forms a ball. 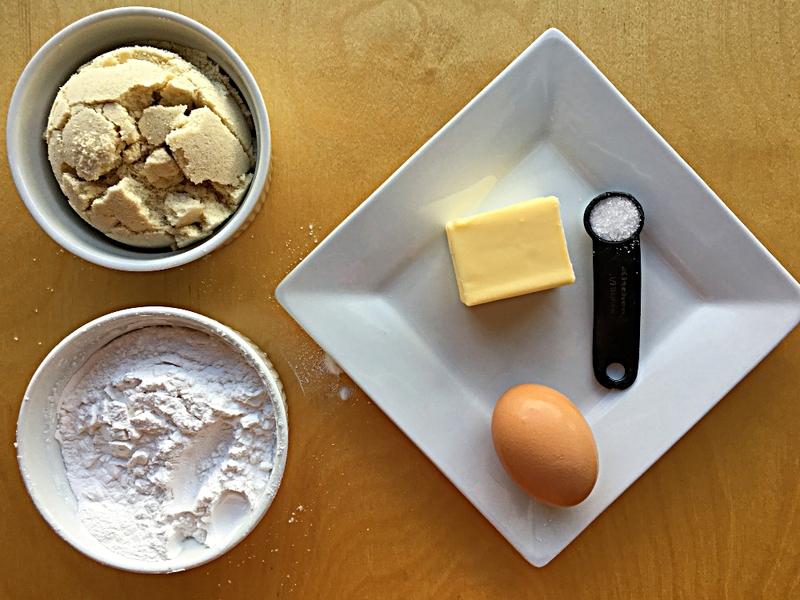 If dough seems a little dry, add about a tablespoon to a tablespoon and a half of water to the dough. If making a double crust, divide the dough in two equal sized balls. Wrap dough in waxed paper, parchment paper or plastic wrap and chill for 1 – 2 hours, or in your freezer for 20 minutes. Preheat oven to 350. Make pie filling and topping (if applicable) while dough chills. Dampen your counter top with a little bit of water. Stretch a 20 – 24 inch long piece of plastic wrap on the damp surface. Place 1 ball of dough in the center. I like to press it somewhat flat and form a circle first. Place another piece of plastic wrap on top. Roll dough out into an even smooth surface about 1/8 -1/4 inch thick and large enough to accommodate your pie pan. Peel off top layer to reveal the pie crust. 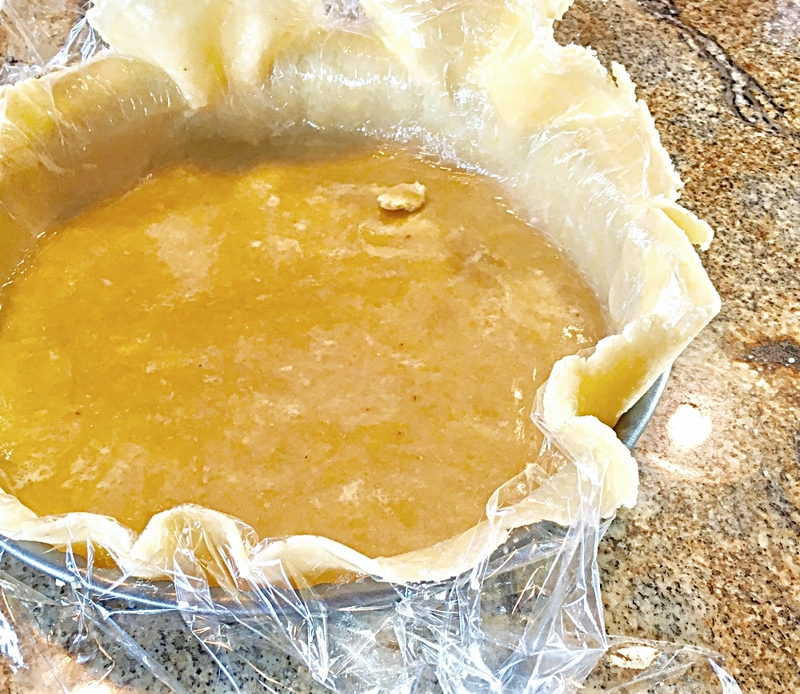 Lift an edge of the bottom plastic wrap, and by placing your other hand under the wrap, lift the whole sheet of rolled dough using the bottom plastic sheet to hold everything together, carefully flip over into pie pan Gently press into pan, prick the bottom of the crust a few times with a fork. Trim and flute edges for a single crust. Repeat rolling out process for top crust. Fill pie and bake as directed. 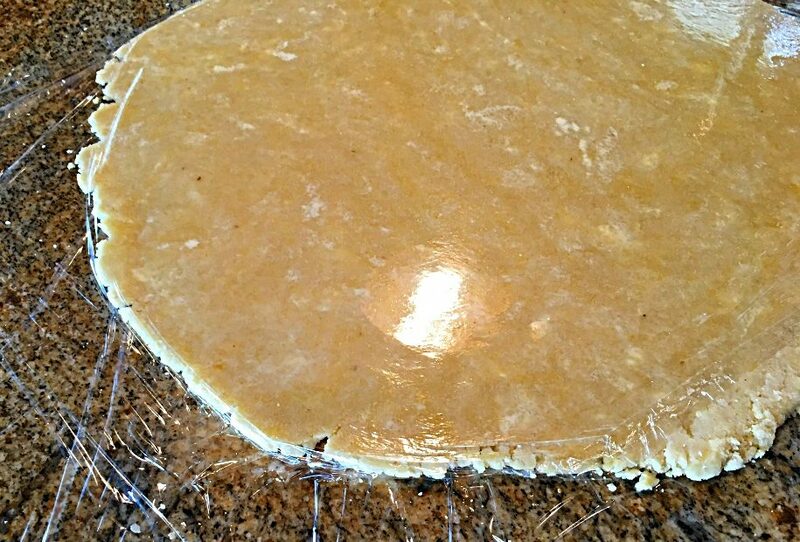 I always cover the edges of my pies with strips of aluminum foil and remove the strips 15-20 minutes before their done baking. OK I’m going to try this. Making pies with my granddaughter Wednesday. Thanks Amy! Cooking with the grands is always so much fun…hope you love the recipe like we do! I wish you lived closer so we could have our own private crust making session Autumn.